Our decision to start a new journal for Postgraduate Research and Taught students in the disciplines of English, Creative Writing and Film at the University of Exeter was rather a spontaneous one. As we state in our editorial introduction to the journal, the initial idea was conceived in a corridor, and within six months or so, we were delighted to present the first edition. We named it Exclamat!on: An Interdisciplinary Journal, and set no thematic constraints for the first issue, so as to appeal to the widest range of contributors possible. Our initial mission for the journal was simple. We sought to create an innovative space in which PGRs and PGTs could engage in current debates and interdisciplinary discussions; we wanted to bring together divergent and creative ideas, and fundamentally showcase work via a new publishing platform within the Department of English. Starting a journal was certainly a challenge, especially as neither of us (the editors) had any prior experience in publishing. We sought initial advice from academics about what they felt a postgraduate publication should contain, how we should proceed, and how it should present English at the University of Exeter to the wider world. One of the key messages was that, to be forward-facing and in keeping with other academic publishing ventures, it should be online and open-access. However, we also felt that such a monumental venture deserved something a little more special for its inaugural edition than simply being uploaded onto the internet. We applied for, and were delighted to receive, funding in the form of the Researched-Led Initiative Award from the Researcher Development team, and the PGR Activities Award from the College of Humanities. As a result, we were able to commission a limited print run of the journal, and to hold a launch event. We wanted to ensure that as many PGRs and PGRs as possible could benefit from the event. To this end, we invited Ben Doyle, the English Editor from Palgrave Macmillan, to join us, to talk to students from across the Humanities about the publishing process, and to answer their questions about preparing and submitting a manuscript. These conversations were then continued informally over a drinks and canapes reception. The event was attended by over forty postgraduate students and academic staff from the Departments of English, History and Classics (to name but a few), the Sabbatical Officers from the Students’ Guild, as well as senior members of the Doctoral College, and received wider support from across the University. The event was appreciated by the audience who described it as a “very useful overview of how to get published” and a “very useful and enjoyable session”. Students felt that they had a better understanding of the publishing process and several mentioned feeling more confident about approaching a publisher once they had finished their PhD. 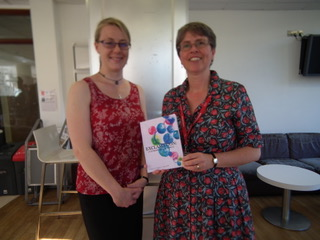 Staff attenders commented on the fact that they now felt able to better advise their PhD students about publication. The link to employability was also noted, with students appreciating the introduction to the world of publishing as a possible profession: “I will look more into publishing as a career prospect” was the action identified by one attendee. 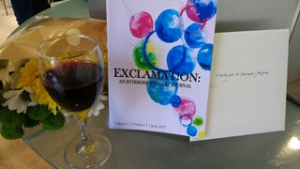 The event in its entirety was extremely successful – much more so than we had envisaged or possibly could have hoped for – and a wonderful way to celebrate the beginning of a new journal. The production of physical copies cemented, for us, the reality of the process, and can now be utilised as an important marketing tool. The funding awards meant that we were in a position to put on a “very, very good” session and create a “fabulous, helpful afternoon”. More importantly, the whole process – from the journal’s inception to the finished product – crucially created opportunities to network, inform, and, most importantly, to celebrate the vibrant and diverse postgraduate community within the Humanities at the University of Exeter. This was our ultimate aim. Even if we do say so ourselves, the journal also serves to exemplify the hard work and achievements of the editors, editorial team and contributors. We hope, too, that it demonstrates just some of the possibilities and opportunities that can occur beyond the PhD thesis. This is most evident, we feel, in the fact that, from beginning to end, it has been a distinctly postgraduate endeavour. The innovative and accessible nature of the journal has also meant that many of the conversations outlined above have continued beyond the first edition. As we now look ahead to the second edition, we hope that our venture will inspire other postgraduate students to get involved, as contributors, peer-reviewers or on the editorial board. As this pilot year, too, was such a success, we now have greater ambitions, and are looking to open up the journal in terms of submissions to all UK institutions. Following on from this, we will be sending out a call for submissions for the second edition, as well as opening up positions on the editorial team in the new academic year, so watch this space! To view the journal please click here. This entry was posted in Doctoral College, Event, News, Opportunities, RLIs by Doctoral College. Bookmark the permalink.